Card-Shark meets Ted Lesley. This is a dream come true for all magicians who love to use a marked deck. 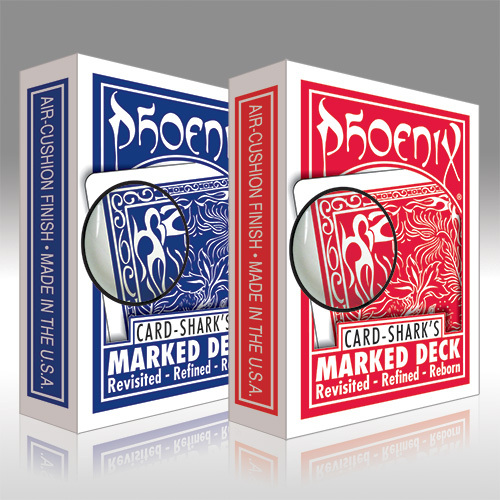 The markings are based on the ideas of Ted Lesley, are extremely visual compared to all other marked decks on the market as they perfectly blend into the design of the Phoenix backs. So far every magician who saw the Marked Phoenix Deck the first time and searched for the markings, had to smile after a while when he found it. You will smile also, promised! All markings are situated at the same spot right in the corner, so even the slightest opened fan will allow you to read the marking. If the back design gets into view, you will be able to spot the value. Can't get easier! These are as innocent-looking as any deck, and are easier to read than most. I loved my original Lesley marked deck, but I had to do all the work myself. Further, the location of the markings on the Phoenix deck is ideal, and, while easier to read, much more disguised than the Lesley deck. Remember, I loved my Lesley deck!!!! But these Phoenix readers are light years ahead!!!!!!!!? ?